Wild Jack is a modern regulated online casino with a plethora of gaming solutions from industry leaders. Mobile users are welcome to visit the mobile version of the casino on the ‘i’ subdomain and enjoy over 50 games (and rising) customized especially for handheld devices. The casino features an informative Winners page that displays This Week’s Big Wins statistics, Hot/Cold Games stats with the current payout percentage and the Today’s Winners moving text line. You can play directly in your browser or download the casino app onto your device. For starters, Wild Jack has published casino game tips, game tutorials and strategies, including a big library of blackjack-related articles related to betting systems in blackjack, blackjack terms and tips to win. Playing and betting at Wild Jack is completely safe, which is certified by regular eCOGRA audits. Australian players are offered a decent range of trusted and quick payment options such as VISA/MasterCard and e-wallets. The minimum deposit and withdrawal amounts are $10 and $50 per transaction respectively, while the upper limit for both is not set, therefore, players residing in Australia are entitled to cash out any amount starting at $50 without any restrictions whatever. A new player is entitled to claim the 100% first deposit bonus up to $250, the 50% second deposit bonus up to $250, the 50% third deposit bonus up to $500, and the 50% fourth deposit bonus up to $600. The entire welcome package must be claimed within a week since the first deposit was made. All the four bonuses are subject to the x40 wagering requirement (bonus amount only). 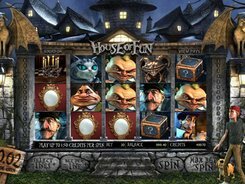 The contribution percentages towards WR vary depending on the game type and you are recommended to view the T&C of the casino to find out more. Finally, regular players would definitely enjoy the benefits of the Loyalty Club and VIP Casino Program. When betting $10 on any game, you earn one loyalty point, and each 500 points can be then converted into $5. Players who are in good standing at the casino are invited to join the VIP Program and become VIP members, which opens up many new possibilities like personal presents on special occasions, participation in exclusive events and luxury getaways. The entire game collection at Wild Jack comes from Microgaming that currently offers an incredible selection of classic pokies, modern pokies, progressive pokies, blackjack and roulette tables, scratch cards and video poker. Some games on the list feature small snowflake or fire icons that denote cold and hot games. 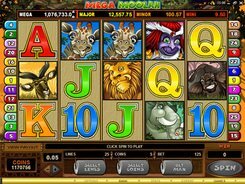 There are over 15 progressive pokies currently presented at the casino, including two Mega Moolah versions, Major Millions (a 3-reel and 5-reel version), King Cashalot, and more – about five of them are compatible with smartphones and tablets.